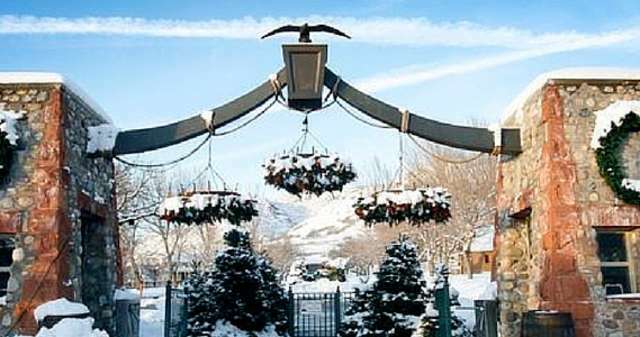 Anytime is a good time to visit This Is the Place Heritage Park, but the holidays offer a festive look back in time to see the West as it was during the early settlement of Utah. Inspired by the world-famous German Christmas markets, Christkindlmarkt SLC offers a unique holiday shopping and cultural experience. Your family can enjoy tantalizing food and festive holiday entertainment as you stroll through wooden vendor booths nestled amid the magical backdrop of This Is the Place Heritage Park. The St. Martin&apos;s Lantern Parade and Christmas Tree Lighting will take place the evening of December 3rd, to celebrate the community-wide coat drive for children in need. Come experience the old-world charm of Christmas. It&apos;s hard to describe the magic of Candlelight Christmas—it just better experienced. The Village is decorated like a Currier and Ives card, and you&apos;ll feel like you&apos;ve taken a step back in time when you attend this enchanting event. Ride one of three trains, the Jupiter, the Blackhawk, or the 119, as they tour around the Park. Or enjoy a ride around the pond on the Mini Train. City kids will love riding ponies and meeting and petting farm animals, and the adventurous visitor can try their skills at milking Clara Bell the Cow. This new site tells the story of mining in Utah through hands-on experiences. Dig for gemstones in Prospectors Pit, and then identify your rocks at the Assay Station. Pan for gold in the creek under the shady oaks. There&apos;s no excitement quite like finding a shiny nugget hiding in the silt and sand. Choose a giant geode and help break it in the Geode Cracker! Learn about local heritage before the arrival of the settlers. Authentic Navajo hogans and Shoshone teepees stand in a quiet circle on the hillside. Grind corn and make arrowhead necklaces. A blacksmith will demonstrate how the West was built with a forge, anvil, and hammer. As you watch him work, he&apos;ll recount how pioneer blacksmiths made and repaired farm equipment and tools and generally kept the settlements in good working order. Try your hand at some old-fashioned pioneer chores, or at spinning and carding wool. There&apos;s endless old-fashioned fun from the bucket brigade to the Candy Cannon that shoots salt-water taffy during special events. And be on the lookout for a train robbery! The Zion Mercantile is filled with sweets from yesteryear and loads of goodies. It&apos;s also filled with treasured children&apos;s gifts and old-fashioned toys, all for a price that will make your wallet happy! The hotel is also the Huntsman Grill, which serves great grub daily; there&apos;s an old fashioned ice cream shop with soft serve and flavor burst cones, and Brigham&apos;s Donuts are cooked fresh every day! A little bit of sugary heaven! While you&apos;re there, see the iconic Monument that was erected under the supervision of a committee composed of Roman Catholic, Greek Orthodox, Protestant, Jewish, and Latter-day Saint representatives. Visit the Walk of Pioneer Faiths honoring early religious groups and leaders who contributed to the religious diversity of our great community. With over 50 historic homes and structures to visit and countless fun activities, there&apos;s a little something for everyone. Admission to the Park gets you all the activities and unlimited train rides for no additional cost. Learn more and plan your visit with This Is The Place Heritage Park’s Virtual Tour.